An outspoken critic of the Iraq war, the retired general was one of the first to argue strongly for a full withdrawal of American troops. 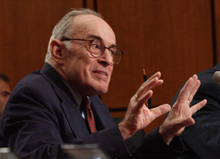 Retired lieutenant general William E. Odom, who died May 30th, apparently of a heart attack, was a fierce critic of the Iraq war, a view he expressed frequently as a contributor to NiemanWatchdog. The tautly reasoned piece was one of the first anywhere to argue so strongly for removing the troops. It hit a nerve, especially because of Odom's background in military intelligence, the positions he had held in two presidential administrations and his earlier reputation as a cold war hawk. What Odom wrote took up just over five pages when printed out--and readers' comments, pro and con, took up another 43 pages. Odom began contributing to NiemanWatchdog during a period when leading news organizations that had run op ed pieces by him in the past had become dismissive of his strong anti-Iraq war views, rejecting articles he either wrote or proposed writing. Over time the views that Odom expressed so strongly and heroically early on came to be shared by an overwhelming majority of Americans. As that happened, the mainstream press and the Democrats in Congress began to call on him with growing frequency, and he never wavered in his hardline message. In February 2007, an opinion piece by Odom titled “Victory is not an Option” got big play in the Washington Post, so that along with an illustration it took up more than half the front page of Outlook, the paper's Sunday think section. And several weeks ago, on a DC radio show, Odom was sharply critical of a Pentagon propaganda program, exposed by the New York Times, in which retired military leaders, put on as analysts by TV networks, could be counted on to deliver Bush administration messages aimed at manipulating public opinion. In February Odom became a senior adviser at the Center for Strategic and International Studies in Washington; previously he had been a senior fellow at the Hudson Institute think tank for a number of years. He was a highly popular professor at Yale, where his classes were filled to the point of overflowing. Last semester he taught a government course having to do with Russia. In an obituary in the Washington Post, Brzezinski said Odom “was both a fighter and an intellectual.” Born in Tennessee, Odom was a 1954 graduate of the U.S. Military Academy at West Point. He served as an infantry and armor officer. Odom learned Russian and received a master’s degree and a PhD from Columbia, and was a military attaché at the U.S. embassy in Moscow from 1972 to 1974. In 1985, under President Reagan, Odom was named director of the National Security Agency, the nation’s largest intelligence operation. When Odom first wrote for Nieman Watchdog, Murrey Marder, a retired Washington Post diplomatic reporter, recalled meeting Odom in Moscow and expressed surprise at his conversion from Cold War hardliner to critic of the Iraq war. Yesterday Marder said that Odom’s “having come out of the most secret side of American intelligence, and the fact that he had a lot of guts and independence, made him the ideal communicator” for criticism of the war. In addition to being a regular contributor, General Odom became a friend to me and to Dan Froomkin, the NiemanWatchdog deputy editor. We will miss him greatly. Survivors include his wife of 45 years, Anne Odom, and a son, Army Lt. Col. Mark Odom, who served in Iraq and was wounded in action there. Mark Odom was once featured prominently in a New York Times Sunday Magazine article. What saddens me most is that Lt General Odom did not live to see us get out of Iraq. The only bright spot is that he knew all along we would get out of there, that it was a mistake to go in there, and that the proponents of the war relied on lies and hysteria to sell it. When it came to anti-war opposition, Odom lead and the rest of the country took a few years to follow. He exposed the lies, asserted the truth, and was proven right in the end. He need not live to see us get out of Iraq, as all he ever seemed to care about when it came to that subject was us getting out of there, and little else. When it comes to the Bush era full of it's villains, cowards, and scoundrels, Lt General William Odom will be remembered as one of the few heroes of such corrupt times. Rest in peace, for you were a true American patriot. Your wisdom will be missed. Thank you for your service.